The RainyDayInterns are tasked with scouring Craigslist and flagging anything which may be interesting to use for DIY projects. We never know what they will find, but they often come up with some pretty cool stuff. A few months ago, they saw a listing for an intriguing microscope. 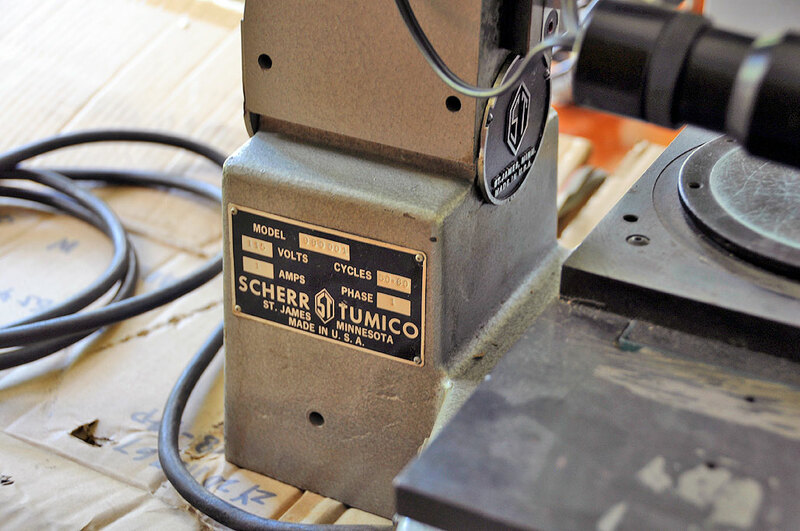 The seller had acquired the scope as part of a purchase of an entire machine shop. The new owner was clearing out equipment which were of no use to him, and so the scope was for sale. We made an offer, but couldn't come to an agreement on the price. Last Sunday, the interns came across the same listing, now priced lower than what we had originally offered. The owner was happy to sell it to us as he did not want to see it go to a scrap yard. The microscope is a toolmaker’s microscope. It is model 98-0001 made by Scherr Tumico. Toolmaker microscopes are used for many purposes. They are used by machinists to verify measurements, by quality control departments to verify that parts have been made to specifications, and a variety of other functions (measuring hole diameters, determining linear distances, checking wear on tooling surfaces, edges, thread pitch and dimensions, etc.). All of those tasks require precision, and optical precision doesn’t come cheap. As a result, the microscopes used for these operations are usually quite expensive, unless one manages to find one abandoned in a warehouse. The microscope we purchased had been doing just that (sitting in a warehouse) for the past year and as a result has accumulated a nice layer of grime. The saving grace was the warehouse was dry. Thus, no mold or fungus on the optics, no rust on the metal, or any signs of damage to the components. The scope is well-built. We are not exaggerating. It is built like a tank. The base is made of cast iron and has to weigh at least fifty pounds. Fortunately, we have a steel bench which could take the weight. There does not appear to be any obvious pieces missing. We have not spent enough time with the microscope to know if everything is working, but all of the knobs turn and most of the other things appear to function. There are many cool pieces on the microscope, but the coolest piece has to be the digital readout (DRO) unit. The DRO is totally old-school. 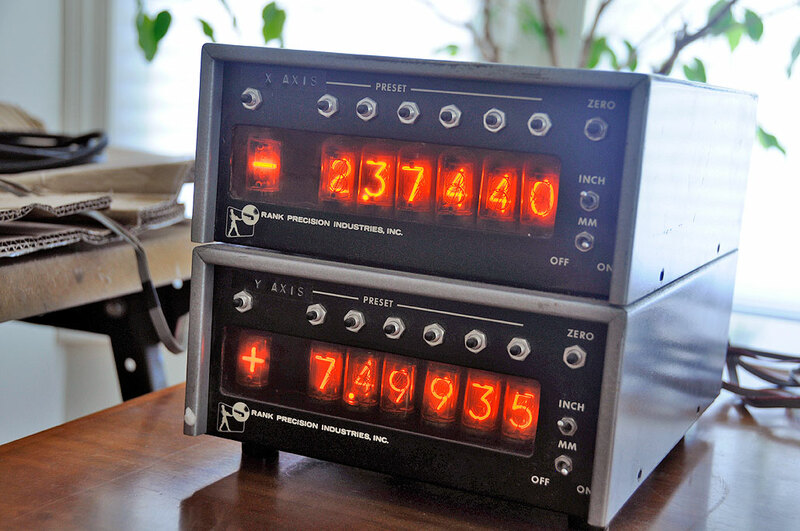 The connectors are heavy-duty and the displays are nixie tube-based. The best part is they all appear to be working! For the price of a decent dinner, we got ourself one heck of a restoration project. It will take us a while to clean the unit up and figure out how everything works, but we think it’s a keeper.